The Mill Creek property is not a material property to the Company. It comprises a contiguous block of 36 unpatented lode mining claims. The claims total approximately 720 acres and are located in the NW part of the Shoshone Range, 33 km south of Battle Mountain. Access from Battle Mountain is south by paved Highway 305 for 33 km., then eastward on the graded dirt Mill Creek Road for 10 km., and then northeast for 2.9 km on a secondary dirt road to the property. The Mill Creek property is in hilly, grass, sagebrush, juniper and pinyon-covered mountain brush high desert terrain, on the lower western slopes of the Shoshone Range. The climate is favorable for year-round mining, with all supplies and services needed for an exploration program available in the Battle Mountain – Elko area. 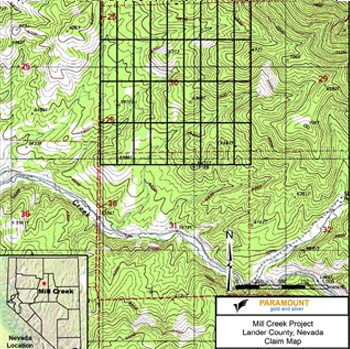 The Mill Creek property is an early-stage gold exploration project. 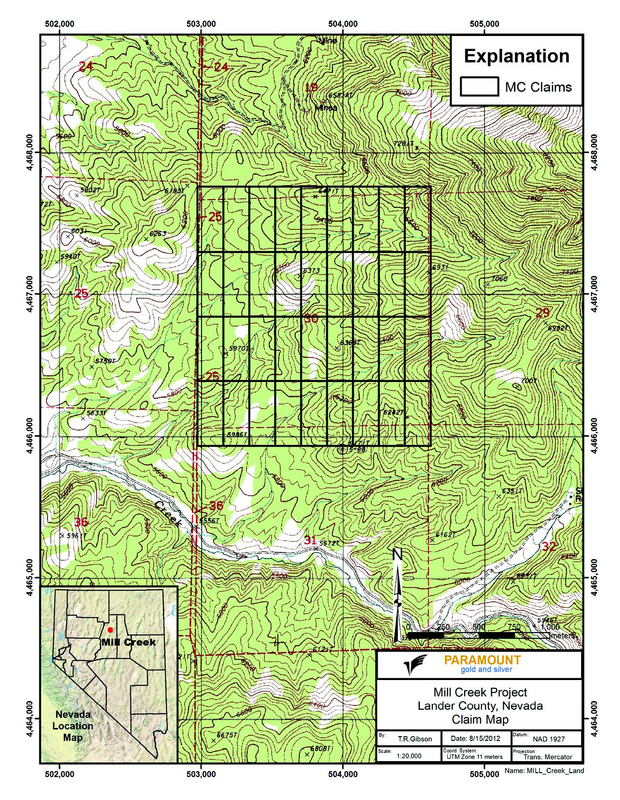 The main exploration target on the Mill Creek Property will be the Carlin-Style gold-silver ores found in altered, metamorphosed, and locally skarnified Lower Plate carbonate and limy to dolomitic clastic sedimentary rocks of the Devonian Wenban Limestone, Silurian Roberts Mountain Formation, and the Ordovician Hanson Creek Formations. A secondary target host rock type is mafic volcanic rock of the Upper Plate rock sequence, similar to Newmont’s Twin Creeks Mine. The economic Battle Mountain – Cortez – Eureka Trend gold deposits were deposited as mineralized hydrothermal sedimentary-host replacement horizons and breccia zones along major fault structural zones where alteration and anomalous gold-silver-arsenic-antimony-thallium mineralization are present. Marbles in metamorphic aureoles and iron-rich skarns appear to be favored sites for gold mineralization in these deposits, perhaps due to the rheological character, permeability after fracturing, and chemical reactivity of those rocks to alteration by hydrothermal fluids. This property is without a known mineral reserve, and there is no current exploratory work being performed.